The miombo forest in Western Tanzania is located in a region in which the main vegetation changes from the tropical rainforest to the acacia savanna. In the miombo forest, there are various plants and animals that originating both in the forest and the savanna (Kano, 1971; Moore, 1994). In recent years, however, miombo forests in Eastern Africa has been reduced by human activities such as slash-and-burn farming and deforestation (Abbot & Homewood, 1999). Since the Ugalla area is the eastern limit for the distribution of chimpanzees (Pan troglodytes) in the African Continent, a large number of primatological and anthropological studies have been performed in the region since the 1960s. However, fewer ecological and behavioral studies of other mammals than chimpanzees have been conducted in this area. It is also important to have better understanding of ecology and behaviors of other sympatric mammals which are less known compared to those of chimpanzees. In this study, I aimed to collect basic data on mammalian fauna at Ugalla, Western Tanzania, especially focusing on bush hyraxes (Heterohyrax brucei). The study was conducted in the Ugalla Forest Reserve, Tanzania,from August to October 2012 (late dry season). First, in order to grasp the diurnal and nocturnal mammalian fauna and their densities, I carried out a line transect census of feces once a week, opportunistic direct observations of larger mammals, and set up camera traps. As a result, at least 1 species was confirmed which were recorded for the first time in this area. Second, in order to obtain basic behavioral and ecological date of bush hyraxes, I collected their dailyactivity patterns by radio-tracking. 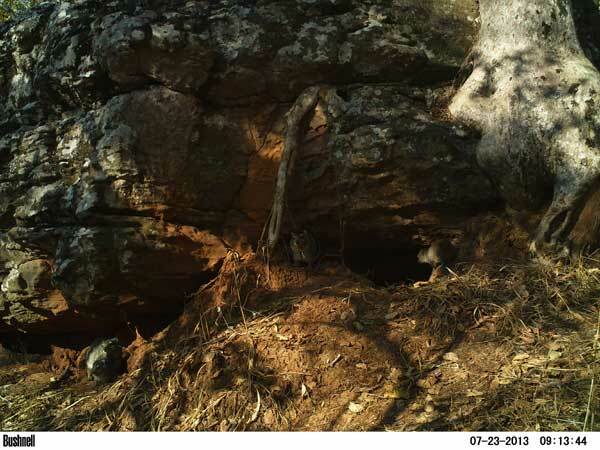 I set also up automatic camera traps in front of their burrows. 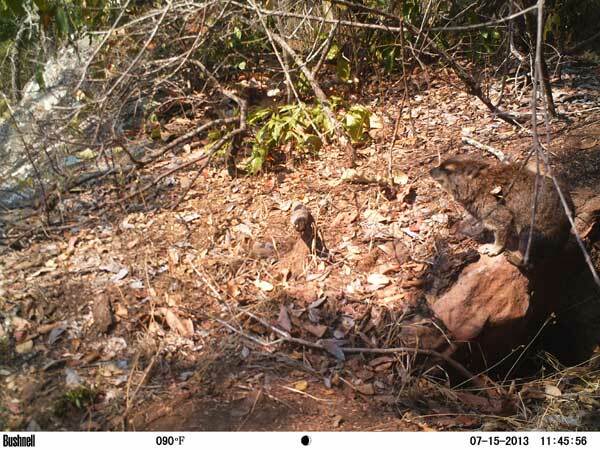 It was found thatthe male hyrax roam large home ranges more than the female. It is also confirmed that the male usually spend most of their time alone. On the one hand the male spend with other females and theirjuveniles. From now on, I will continueanalyzing the data more in detail.